Regardless of what you do, you need to present yourself along with your ideas powerfully in today’s dynamic age of information. Speaking well influences viewpoints, closes deals, motivates listeners, enhances your business, while elevating your reputation. Whether you’re an investor, employee, entrepreneur, or unemployed, the ability to present yourself and your ideas well has never been more important. Most will get the jitters speaking in public. What’s known is that this stage fright can be reduced by preparation. It can be as easy as breathing deeply while preparing yourself mentally. What preparation and practice alleviates is anxiety, which ultimately provides a foundation for achieving extraordinary results. Start by creating template presentations using Power Point. Just present one idea at a time. Use no more than six lines per slide using large readable fonts. Most prefer little to no slide animation. Summarize often, never read directly from your slides and always face your audience. Keep in mind that the audience focuses on you, and not the visual aids. Condition your audience, provide printed material such as your mission statement and values first. Find out what type of “pain” that they’re facing and how your product, service, or topic can solve it. Address these challenges, outline the objectives and purpose of the meeting. 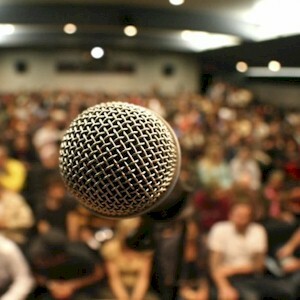 Discuss what the audience wants to hear or what they can achieve. Are the other presenters offering similar products to yours. When are they presenting, how much time are you allocated, is there a Q&A, and if so, is it included in your total presentation time. Get the date, directions to venue, presentation start/end times, dress code, attendees, equipment availability, all beforehand. Know the environment, know the business and cultural etiquette. Have memorable openings and closings, this by asking a question. Mention relevant news, use a quotation or a video clip. Most like visuals so be creative. Use humor throughout your talk. If you’re not funny, use humorous photos, clip art, quotes, or memes. Never tell a joke that would even remotely offend one person. Relate your closing statement to your opening, coming full circle. Once your content is ready, then practice out loud. Pay close attention by memorizing your start, key points, and the ending. If you need a guide, use note cards or visual cues. During this process is when you’ll make revisions and improvements. After rehearsing several times, record and time yourself on video. Review your practice session, make adjustments, be critical until you’re satisfied with your content and delivery. Plan in advance what to wear, choose appropriate clothes which makes you look and feel great. Dressing well gains you instant respect while boosting your confidence. Always dress slightly better than your audience. Reconfirm the date, time, agenda, and venue. If traveling, pack early and have a checklist of last minute items. Always carry your multi-media and notes that you need for your presentation with you. The day before the presentation, avoid excessive alcohol, too much caffeine, chocolate, unsettling food, and antihistamines, this because of their dehydrating effects. If flying, the air in planes is thin, so speaking can put a strain on your voice so save it. A moist vocal tract gives you the best vocal sound with the least physical exertion. Stay hydrated by drinking plenty of lemon water. To avoid mucus buildup, stay away from dairy products and sugar. Grain alcohol, vodka, red wine, and beer can also increase mucus. If you’re unable to avoid alcohol, then drink white wine. Make sure you get sufficient sleep for maximum performance. Be prompt by starting and ending on time. Relax and relate with the audience before you begin. Remain flexible by altering your presentation to suit the audience. If possible, make eye contact while speaking to your audience as if you were having a conversation one on one. Move around while gesturing freely. Smile, have fun, always be enthusiastic about what you’re saying. Focus on delivering maximum value, it’s all about them. If your presentation isn’t recorded, then get someone to video your presentation for playback and feedback later. An alternative is a pocket audio recorder. These recordings are also useful for reviewing questions, comments, objections, and actionable items. Always make sure that you leave a handout, brochure, or a business card so anyone can easily contact you. The path to any type of mastery is practice. Any journey begins by taking a single step, to take action and then learning and building from there.